Beautifully engraved certificate from Fashionmall.com . This historic document was printed by the American Banknote Company and has an ornate border around it with a vignette of the company name. This item has the printed signatures of the Company's President and Secretary (Raymond J. Murphy). 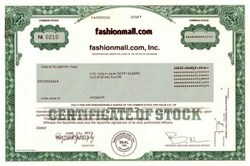 Fashionmall.com engages in the business of marketing, promoting and advertising fashion apparel and related accesories or products to the public on the internet, via their web sites. For the nine months ended 9/30/01, revenues fell 29% to $2.6M. Net loss applicable to Common fell 99% to $73K. Revenues reflect non-renewal of prior client contracts. Lower losses benefited from a reduction in advertising and marketing expenses.